It’s that time of year again when many of us who celebrate Christmas and New Year are feeling the pinch of some kind of regretted over-indulgence. With that, it’s no wonder why Cancer Research UK and Alcohol Concern choose January to promote their month-long alcohol-free fundraising events to encourage people to abstain from drinking alcohol, because – let’s admit it – some of us are probably thinking of having a short break from it anyway. So, why bother giving alcohol a break? Well, besides alcohol having fast become one of the most common causes of death (alongside smoking and high blood pressure), the liver’s incredible ability to repair and regenerate means the first and second stages of alcohol-related damage to the liver are actually reversible, simply by abstaining from alcohol. “Stages”? So what are they, and how many stages are there? 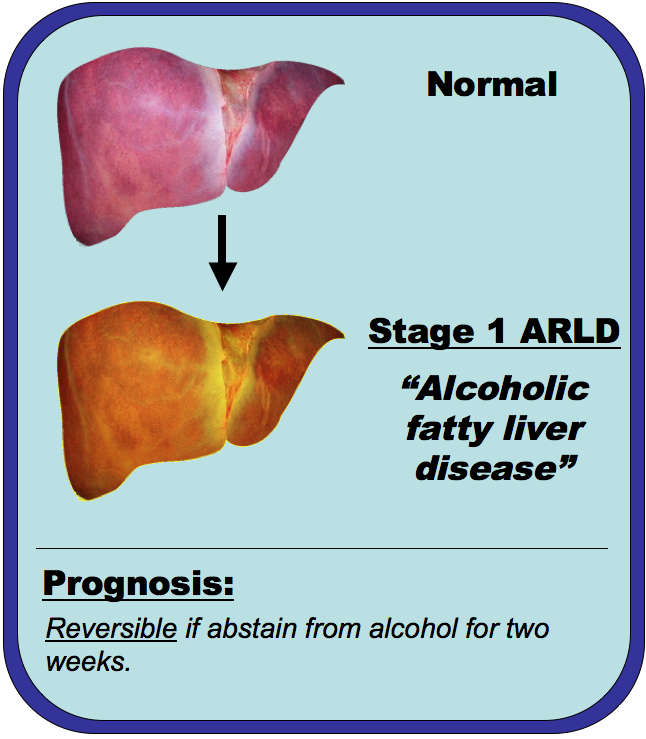 The first stage of ARLD is known as alcoholic fatty liver disease, which is basically when the cells in the liver become replaced by fat as a result of processing the alcohol. The fat gives the liver a yellow appearance. (Diagrams of diseased liver are for illustrative purposes only and don’t represent actual images). Alcoholic fatty liver occurs in anyone who exceeds 60g of alcohol in a day. Luckily, it is reversible, but annoyingly this condition doesn’t come with many alarm signs as it is often symptomless, so we just need to be conscious of our alcohol intake to make sure we’re within the safe limits before the condition progresses into the second stage. But how much is 60g of alcohol, ya know, in pints or whatever? What does 60g of alcohol look like? 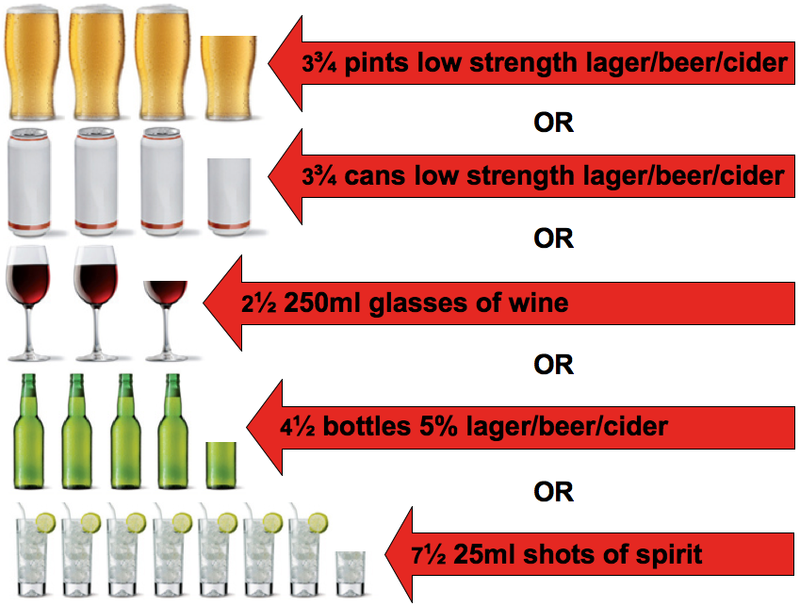 Not shown: For higher strength lager/beer/cider, only 2½ pints amount to 60g of alcohol. Apart from the spirits, it doesn’t look as much as you’d probably expect. If the daily limits are exceeded for a prolonged period, this can cause inflammation of the liver. 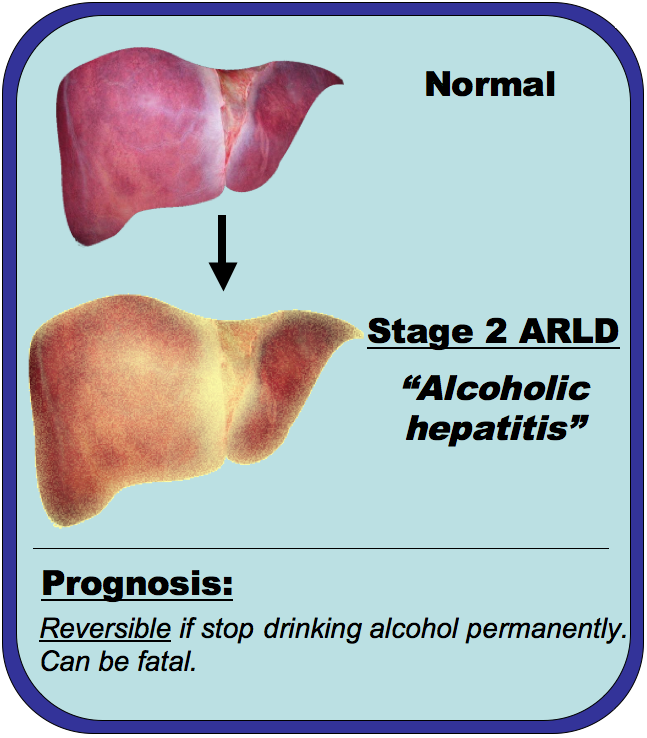 This is the second stage of ARLD and is called alcoholic hepatitis, which shouldn’t be confused with infectious hepatitis caused by pathogens such as Hep B and Hep C.
An individual with alcoholic hepatitis may present with a few symptoms now, and these can include jaundice, swollen and tender abdomen, nausea/vomiting and weight loss. Sadly, few cases of ARLD are diagnosed sooner than the second stage due to the lack of symptoms in its earliest stage. 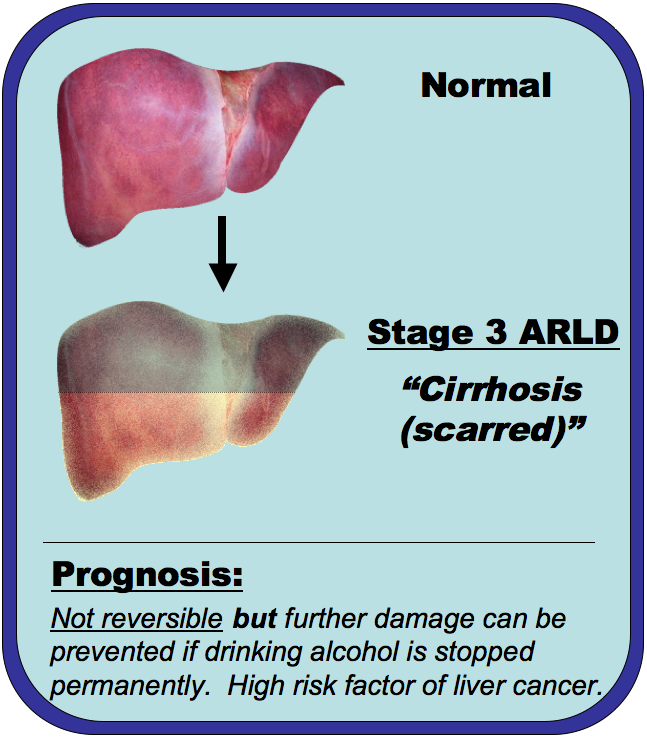 The final stage of ARLD is when parts of the liver become so damaged through alcohol misuse that they becomes scarred (or cirrhotic), causing partial loss of function. This condition is known as cirrhosis. 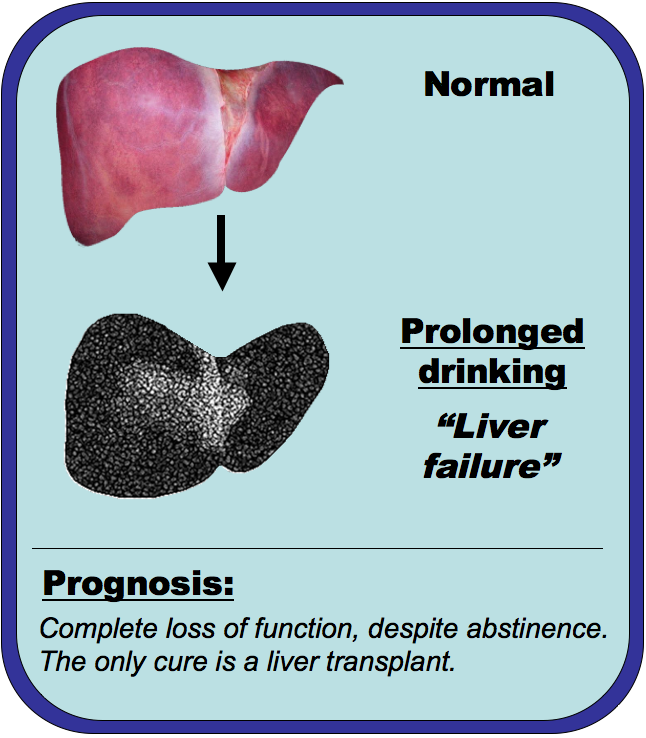 If an individual with a cirrhotic liver continues to drink alcohol, the liver becomes so badly damaged that it loses complete function and the only cure is a transplant. So, what amount of alcohol is actually considered safe? In the UK, the national drinking guidelines set by the Department of Health recommend that men should not exceed 3-4 units (24-32g), and women should not exceed 2-3 units (16-24g) of alcohol a day. As you can see these are all well below 60g. Guidelines also recommend a 48-hour abstinence after a binge-drinking session. “Binge-drinking” basically means drinking more than the recommended daily limit. Whether or not you feel like you overdid the drink over the festive season, you can see why the charities feel it’s important to raise awareness of alcohol-related liver disease at this time of year. Alcohol misuse can lead to such fatal consequences, and to think this could be prevented with just a simple solution as a two-week abstinence early on. So, if you feel that giving up drink for the whole of January is a bit too ambitious, seeing as alcoholic fatty liver disease can be treated with a two-week abstinence, why not try the two-week alcohol-free challenge instead? See if you can feel a difference. You might just surprise yourself. Statistics on alcohol from Alcohol Concern. “Dryathlon” from Cancer Research UK. “Dry January” from Alcohol Concern. Keeping track of drinking habits to cut cancer risk from World Cancer Research Fund. Tips and advice for Change4Life’s “Choose less booze” campaign. Calories in alcohol from NHS Choices. Advice and support from NHS Choices for people caring for alcoholics.